I recently ordered a 25lb box of tangerines from a farm just south of San Antonio. I anticipate Austin’s local citrus options all year long, and now winter has descended upon us in her chilly cloak. The Christmas tree is up and I’m working my way through these jewels, eating one for every one I juice or chop up for marmalade. Don’t forget to enjoy as much as you can fresh! Raise heat to med-low and bring syrup to a boil, then reduce heat to just high enough to maintain a simmer; simmer for 20 minutes, stirring occasionally to keep from scorching. Syrup will become glassy and the bubbles will be about the size of dimes (or slightly smaller), spaced throughout the pot. 2. Juice ~3lbs tangerines to produce ~3 cups tangerine juice. Up the tangerines to 4 or 5lbs (yielding 4-5 cups juice) if you’d like a slightly less sweet, more zingy syrup. 3. Add between 3-5 cups strained tangerine juice to the reduced syrup and bring the mixture back to a boil. Remove pot from heat. Warm lids in a saucepan, bringing them to a simmer and removing from heat. 4. Place fine mesh strainer over your canning funnel, and ladle syrup into warm jars. Wipe rims clean of any syrup spills, use two-piece lids and process in waterbath for 10 min. 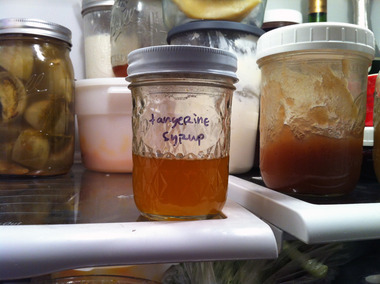 Once sealed and stored, the tangerine juice will create a film and settle toward the top so give the jar a gentle shake before use to redistribute the mixture. 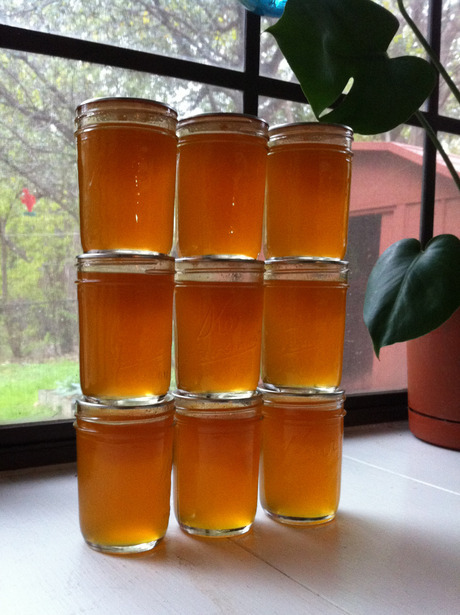 Not-canned variation: Reduce recipe volume by half and use 2 pint jars, storing them in the fridge, where syrup will keep for about 3 months. Alternately, make the whole recipe and divvy it up amongst 9 half-pints or other decorative syrup pouring vessels and give to local friends as gifts as you would a sealed jar (with a note that it must be refrigerated). Now, what to do with it, suggestions of what to put on the gift tag. 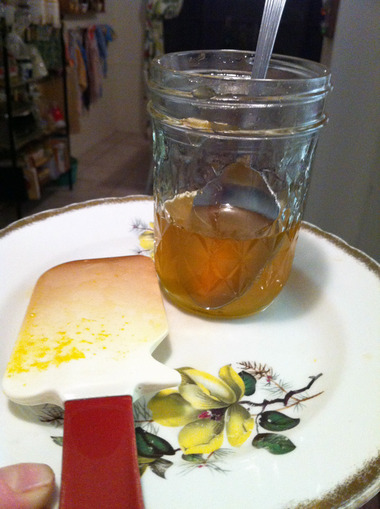 Reader idea: Spiced tangerine syrup with rum! If you have ideas for creative syrup uses, add a comment below and I’ll add it to the list here!